Who invented Braille? The name of the person credited with inventing Braille is Louis Braille (1809 - 1852). Louis Braille is not only famous as the French inventor of Braille but also as a talented musician and educator. When was Braille invented? Louis Braille invented Braille in 1824, during the Industrial Revolution period of invention (1700 - 1860). Definition of Braille: Braille is defined as a system of reading and writing for the blind or visually impaired in which the characters are represented by patterns of raised dots represent letters and numerals. Fact 1: Who invented Braille? Braille was invented by Louis Braille in 1824 during the Industrial Revolution era of inventions (1700 - 1860). Fact 2: Who invented Braille? 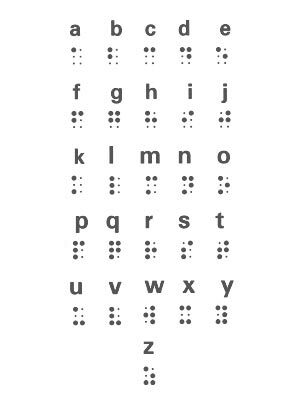 Prior to the invention of Braille in 1824, there was not an effective communication system for blind people. Fact 3: Who invented Braille? Valentin Hauy (1745-1822) founded the Royal Institute for Blind Youths in Paris in 1784, the first school of its kind for blind children in the world. Fact 4: Who invented Braille? The history of Braillle began when Valentin Hauy developed a method of raised letters, to teach a blind student to read sentences but his students were unable to reproduce the letters themselves if they wanted to write. Fact 5: Who invented Braille? Another Frenchman called Charles Barbier de la Serre (1767 – 1841), who was serving as a captain in Napoleon Bonaparte’s army, independently invented a coded system known as "night writing" in 1817, to enable soldiers to transmit messages silently, without light during the night that could be read by touch. Fact 6: Who invented Braille? The "night writing" system consisted of a 6x6 inch square grid divided into two columns of dots embossed on a square of paperboard. The raised dots represented a letter or a phonetic sound. Fact 7: Who invented Braille? In 1821 Charles Barbier introduced his "night writing" system to the Royal Institute for Blind Youths in Paris. A 12-year-old blind student, Louis Braille, attended Charles Barbier’s introductory lecture and inspired by the work of Valentin Hauy and Charles Barbier went on to invent the tactile reading and writing system for blind people, that became known as Braille. Fact 8: Who invented Braille? The inventor Louis Braille, was born on 4 January 1809 in Coupvray, France and died on 6 January 1852. Fact 9: Who invented Braille? The early years of Louis were spent in Coupvray, France where he was raised by his family. Louis was blinded in a tragic accident when he was just three years old. Louis accidentally stabbed himself in the left eye with his father’s awl, a tool that he used as a leather-worker and saddle maker. Complications set in and resulted in his losing vision in both eyes by the time he was four years old. Fact 10: Who invented Braille? Louis was provided with a basic education by Father Palluy, a priest at the local Catholic church. When he was ten years old, in 1819, Louis won a scholarship and began to attend the Royal Institute for Blind Youth in Paris. Fact 11: Who invented Braille? Louis was taught by Valentin Hauy and learned the method of reading with the use of raised letters that had been invented by Hauy. Fact 12: Who invented Braille? In 1821 he was introduced to Charles Barbiers' night-writing system and became inspired and determined to develop a new system to help blind people to read and write. Fact 13: Who invented Braille? Louis worked on his new system for three years and in 1824, at the age of 15, he was presented his new method to Dr. Pignier, the director of the Royal Institute for Blind Youth. Fact 14: Who invented Braille? Louis Braille's tactile system was to pass their fingers of blind people over embossed dots and "decode" the corresponding letters or symbols. Fact 15: Who invented Braille? His new system was built on cells of six raised dots. The configuration of raised dots represented a written symbol. Louis also adapted the system to encompass math and music notation. Fact 16: Who invented Braille? Louis graduated in 1826 and became a student teacher and then was given a full-time teaching position at the Paris Royal Institute for the Blind. Fact 17: Who invented Braille? There was a great deal of scepticism regarding his ideas and although he shared his method with the students, it was officially banned at the Institute during his lifetime. Fact 18: Who invented Braille? At the age of 40, Louis was forced to leave the Institute and move back to Coupvray due to a persistent respiratory illness caused by tuberculosis. Fact 19: Who invented Braille? Louis died on 6 January 1852, just two days after his 43rd birthday. He was buried at the village cemetery in Coupvray. Fact 20: Who invented Braille? His invention was adopted by the Institute for the Blind shortly after his untimely death and his work was officially recognised by the French government. Fact 21: Who invented Braille? One hundred years after his death his body was was moved to the Pantheon in Paris, to be laid to rest alongside other French national heroes. Fact 22: How did Braille impact the world? The ingenious system that enabled blind and visually impaired people to read and write is used across the world. Fact 23: The system can be found in a variety of useful places and on items such as clocks, watches, thermometers, computers and ATM machines.